Ice Dragon Wallpaper. 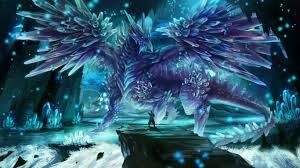 An epic wallpaper of an ice dragon facing off with a human. Wallpaper and background images in the Dragons club tagged: photo ice dragon dragons ice dragon crystal crystals blue purple. This Dragons photo might contain pacific sardine, sardinops caerulea, and agave tequilana.